This is a gorgeous 2014 BMW M6 Gran Coupe with an immaculate individual paint job from BMW called Frozen Silver Metallic. 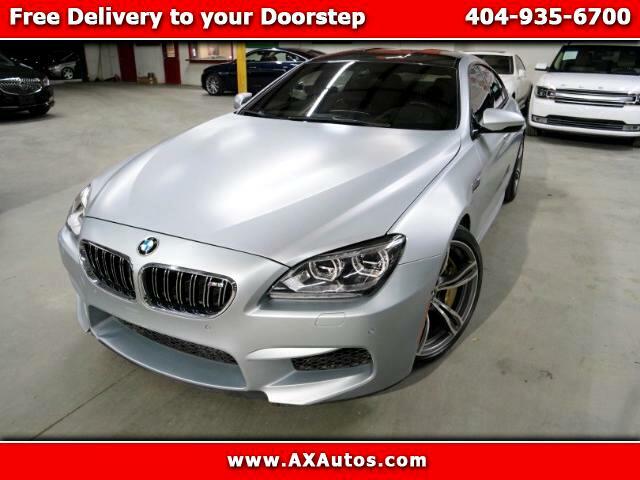 This vehicle includes plenty of incredible features that makes this M6 Grand Coupe stand out. We Finance! We Accept Trade-Ins! Carbon Ceramic Brakes.Bang&Olufsen High End Surround Sound. LANE ASSIST. COLLISION ASSIST. BLINDSPOT ASSIST. INDIVIDUAL BMW PAINT. PASSPORT LASER DETECTOR. This is BMW M6 Grand Coupe it's the near-perfect combination of style, luxury, and performance... this is definitely BMWs most attractive and beautiful driving machine. The vehicle will come with a Rebuilt title due to previous water damage... The vehicle has been inspected by the state of Georgia and by an authorized dealer and serviced. This vehicle was claimed with thousands of vehicles and the insurance company didn't have time to go through each car and this one is a perfect vehicle. Car must be financed from Credit Union or paid in Cash we do have credit unions that we work with to finance you in this vehicle. Message: Thought you might be interested in this 2014 BMW M6. This 2014 BMW M6 Gran Coupe is in excellent condition and has nothing wrong cosmetically, mechanically, or physically. Below you can see the Carfax attached for free. This vehicle is will come with a Georgia Rebuilt Title because it was previously totaled because of flood damage. We have already bought 100s of cars from Houston because of Hurricane Harvey hundred and thousands of cars where totaled because of water damage; however, some cars shouldn’t have been totaled, but insurance companies didn’t have time to inspect every single car, so they totaled out every single car. Our team went out to Houston and inspected each single car before purchasing it. Most vehicles that we purchased didn’t have any water and some only had damp carpets. Regardless once the vehicles arrived in Atlanta our professional team went through every single car and removed all the carpets and seats and checked every single connector and made sure everything was working perfectly. This car has no odor and no faults. Everything works, and nothing is wrong.